In my last post, I described simply getting a new battery. Its funny how something so small can create cascading issues. I continue to wrestle with the electrical demon I unleashed, but on Saturday I did a little job on the interior getting a new interior skin on an otherwise really ugly wall. I'll go over that today. I readily admit Hapy is a frankenbus. He runs a 1972 shell with a '72 Riviera top, '74 front seats, some bits of a '79 Westy camping interior, an '85 vanagon middle bench and a '98 New Beetle TDI engine. 3 years ago (See: From Fridge to Storage), I removed the fridge guts from the fridge cabinet because those old Dometic fridge's weren't very powerful nor useful. The cooling element sits right in the middle of the opening, so you can only put small things in anyway, and I really prefer the portability and size of a basic cooler. The empty cabinet provides some nice storage. 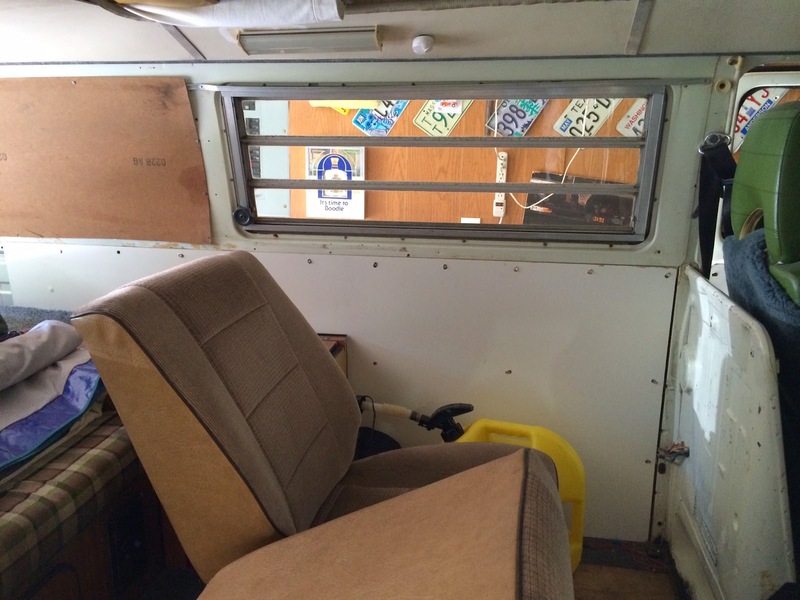 Last Fall, I removed and sold off the little kitchen to another fellow bus lover because I couldn't fit the kitchen and the middle bench seat (See: Vanagon Seat Install). That left a very ugly interior between the old fridge cabinet and the backside of the driver's seat. Since I'd already constructed door cards for the front cab doors, I figured "how hard could it be?" Turns out, the answer is "easy!". 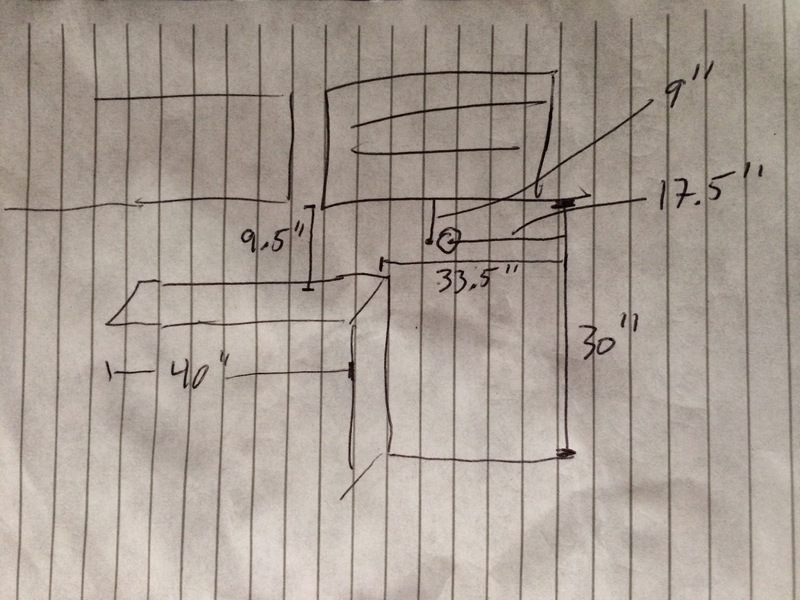 After measuring the space I wanted to have covered, and adding a 1/2" lip to fit behind the old fridge cabinet, cutting a card for the ugly wall was easier than the door cards. Why? This card has straight edges and 90* corners. Part of the measuring took into account the fact that I install and remove the rear closet on the driver's side. In Winter, especially, that cabinet is out, and the ski-rack sits there. I cut the card so that it stops at the end of the fridge cabinet with an expectation to have a removable card to put in when the closet is out. I'll do that later. I figured out a few tricks with my tools along the way. I have a right-angle, but to make sure I measured a consistent number of inches out as I created a line parallel to the edge, I put a spot of tape at the right length. Then, I just needed to mark at the tape edge, slide the right-angle and repeat. Then, it was a simple matter of aligning the dots with a straight-edge. This removed the possibility of mis-measuring one or more of the dots. Also, I used clamps and the steel straight-edge to set a fence against which I ran the Dremel-router so I got a nice straight cut. The interior wall has all kinds of holes in it. Some were put in by the factory for the original card. Westfalia added some for the 1972 camper interior. All thos holes made the interior look even worse. Like the holes in the doors, the original card holes were a touch too small, so I opened them up with the steel-bit I used before. I test-set the card, and eye-balled where the holes needed to be drilled in the card. I actually guessed too good for a number of them, landing the card-hole right on top of the bus wall-hole. This makes mounting the card challenging. The clips have a small offset, so it's best if the holes are too. Still, the resulting card looks fantastic.